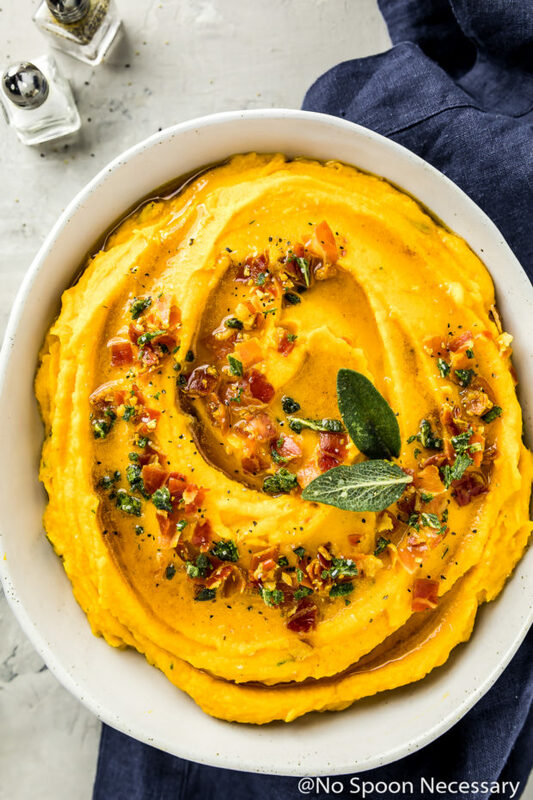 These Pancetta & Sage Brown Butter Whipped Sweet Potatoes are easy and effortless, yet elegant and loaded with flavor! Roasted sweet potatoes are whipped with crème fraiche and studded with crispy, salty pancetta, earthy sage and drizzled with fragrant brown butter. Light, airy, sweet, savory, and guaranteed to please, these potatoes are the perfect addition to your holiday table! This post was originally published in November 2017. 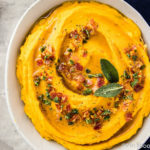 I edited the photos and updated the post below to include more information about these easy mashed sweet potatoes. Plus, I added a recipe video to show you how painless these Sage Brown Butter Whipped Sweet Potatoes are to make! So, I feel like ish is about to get real. And by ish, I mean the holidays. I just had to triple check my calendar, because even though I’m well aware of the fun fact that this year is flying by at warp speed, I didn’t believe my peepers when I saw that Thanksgiving is only 2 weeks away. Hopefully if you are hosting turkey day dinner this year, you are starting to plan out your holiday menu!! With that said, I feel like this is the perfect time to segue into talking about ‘taters. Last year, I mentioned that potatoes are an integral part of my holiday menu. I mean, a party just ain’t a party without some spuds! 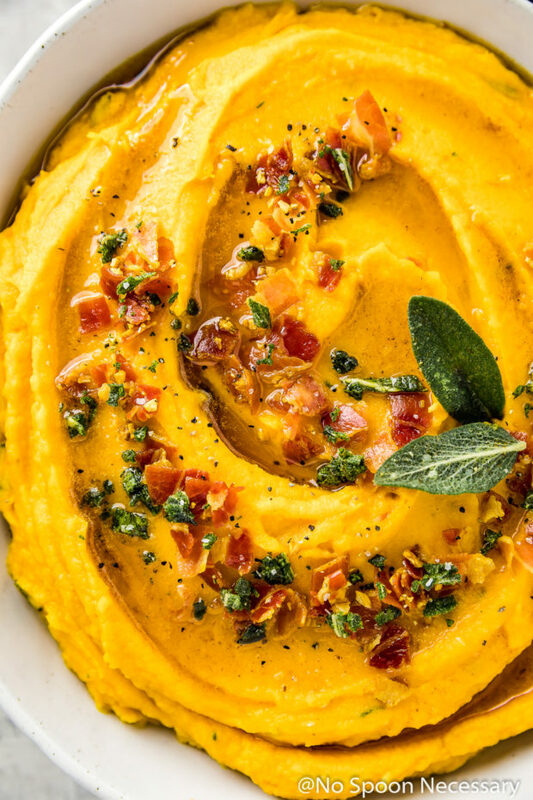 Silky smooth, light and airy roasted sweet potatoes whipped with rich crème fraiche and studded with crispy, salty pancetta, earthy sage and drizzled with fragrant, nutty brown butter. These whipped potatoes are rockin’ ALL the sweet and savory vibes, friends! If you are looking for light, ultra-fluffy and decadent potatoes to add to your Thanksgiving table, look no further!! On top of these ‘taters tasting BEYOND delicious, they are also stupid easy and a cinch to make. If you can turn on the oven and operate a food processor, you can make these spuds! Speaking of the oven, you know how some mashed potato recipes come out bland and/or watery? NOT THESE! Roasting the sweet potatoes brings out their natural sweetness and ensures moist, evenly cooked, airy (not watery) whipped potatoes! How to mash sweet potatoes without a mixer? 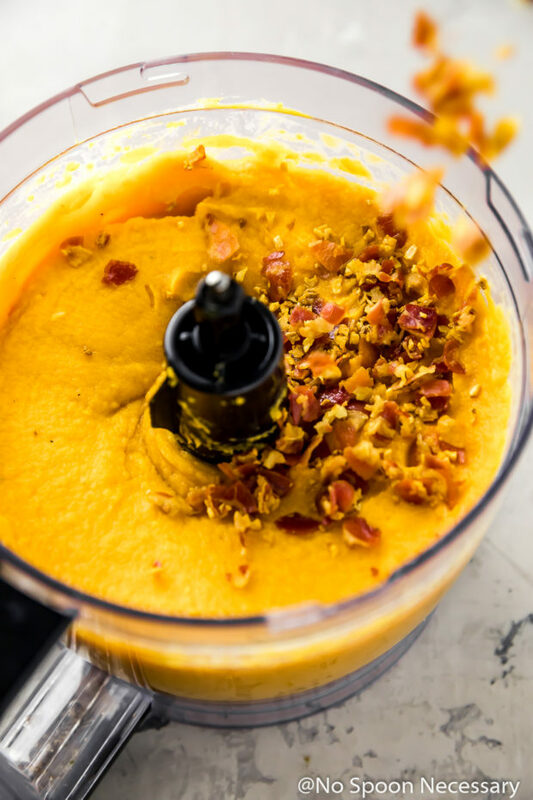 You can absolutely mash or whip sweet potatoes without a stand, or handheld, mixer! In fact, I actually prefer to make these whipped sweet potatoes in the bowl of a food processor. I have found that using the food processor to whip sweet potatoes instead of a mixer results in a more evenly whipped, light and airy sweet potato. 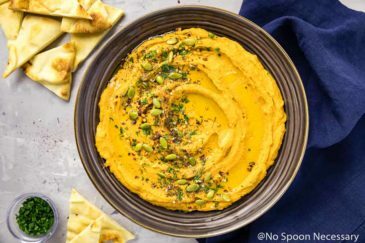 How long will whipped sweet potatoes keep? To store whipped sweet potatoes, make sure you follow the directions as written below and allow the potatoes to cool completely. Leftover whipped sweet potatoes should be stored in an airtight container in the refrigerator. Properly stored mashed potatoes will keep for 3-5 days in the refrigerator. Can whipped sweet potatoes be frozen? 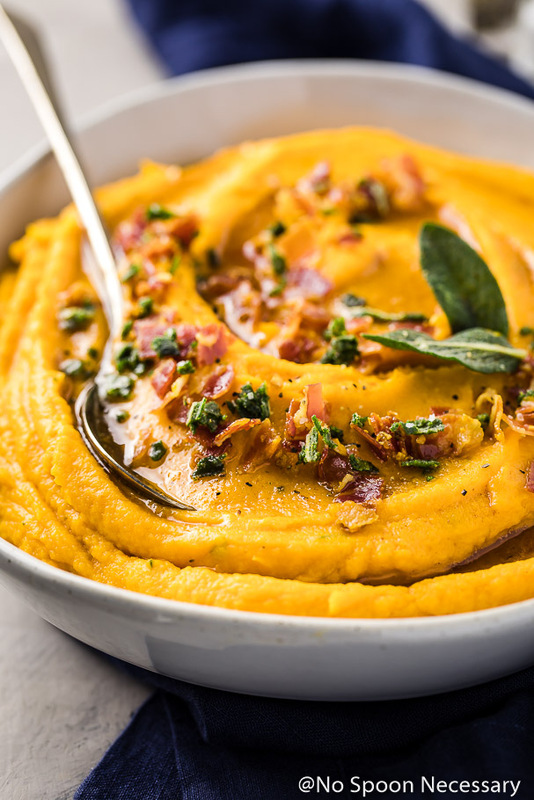 You can absolutely freeze mashed sweet potatoes, although their texture won’t be exactly the same once they are thawed and reheated. To freeze whipped sweet potatoes, transfer completely cooled potatoes to a large, freezer safe zip-closure bag. Flatten the bag to get out as much air as possible before sealing closed and store the potatoes so they are flat (it will make them faster and easier to thaw). Store the whipped sweet potatoes in the freezer for up to 3 months. How to thaw and reheat frozen whipped sweet potatoes? Thaw frozen mashed sweet potatoes overnight in the refrigerator. Once ready to eat, sweet potatoes can be reheated a few different ways. Stovetop: Transfer the sweet potatoes to saucepan and place them, covered, on the stovetop over medium-low heat. Stir the potatoes occasionally and cook until heated through. Add additional butter or seasoning as needed. Oven: Transfer the sweet potatoes to an oven-safe dish. 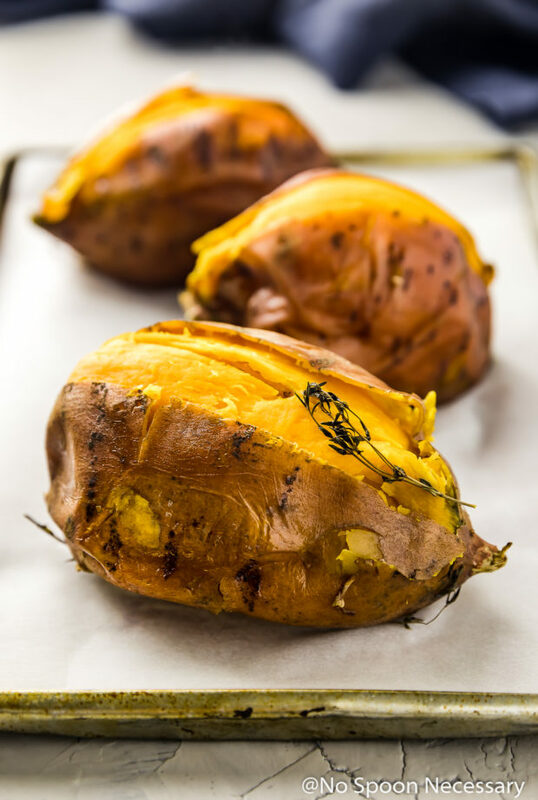 Cover the dish with aluminum foil and place in an oven preheated to 350 degrees F. Cook for 25-30 minutes, or until the sweet potatoes are heated through. The recipe below calls for 3 pounds of sweet potatoes, which is roughly 3 large sweet potatoes. But, the weight of 3 pounds is a rough approximation for the recipe! If you are a little light, or a little heavier on the potatoes, it is no big deal! While the recipe does use pancetta, you can absolutely substitute plain bacon if you would like! Simple proceed with the recipe as instructed replacing bacon for pancetta in the recipe. While I do recommend crème fraiche in this recipe, you can use full fat sour cream if you can’t find crème fraiche or simply don’t like it. If making the substitution, please be aware that crème fraiche is thicker, richer and less tangy than sour cream. The recipe below calls for half-and-half, but if you like richer potatoes, you can absolutely use heavy cream. The amount of half-and-half (or heavy cream) you use in the recipe will depend on personal preference and the desired consistency of your potatoes. I used 2 ½ tablespoons in mine. 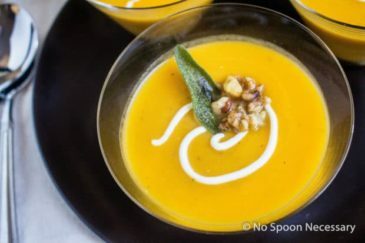 If you would like to drizzle the top of the whipped sweet potatoes with brown butter you can either reserve 2-3 tablespoons of the brown butter before adding it to the food processor, or you can simply make more brown butter. The recipe below serves 4-6, but can easily be doubled!! 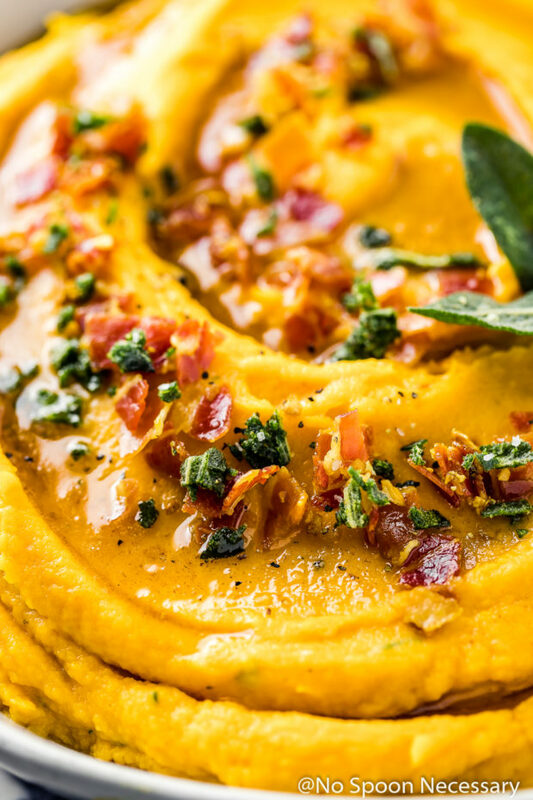 Put down the marshmallows, or whatever weird ingredients you add to your sweet potatoes, and give your potato side dish LIFE with these Pancetta & Sage Brown Butter Whipped Sweet Potatoes. Trust me, your Thanksgiving table DESERVES these ‘taters! Until next week, friends, cheers – to terrific tubers! 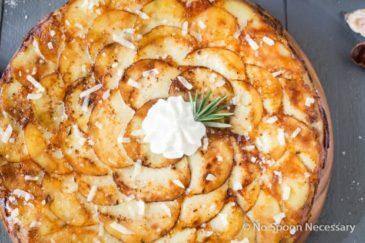 Bake potatoes: Poke the potatoes several times with a fork and individually wrap each potato with 1 sprig of thyme in a sheet of aluminum foil, folding the foil and crimping the edges to seal tightly. Transfer the pouches of potatoes to a baking sheet and roast for about 1 hour, or until a thin skewer easily inserts into the potato with no resistance. Remove the potatoes from the oven and set aside until cool enough to handle. Meanwhile, in a large skillet over medium heat, cook the pancetta, stirring often, for 5 minutes or until pancetta is almost crisp. Add in the garlic and cook, stirring, for another minute or until garlic is fragrant. Use a slotted spoon to transfer pancetta and bacon to small plate and set aside. Drain the grease from the pan. In the same pan you used to cook the pancetta, add the butter. Reduce heat slightly to between medium and medium-low. Melt the butter, swirling the pan gently, until the butter starts to turn pale golden, about 2-3 minutes. Add the sage leaves and fry until crispy, about 30-45 seconds. Use a slotted spoon to remove the sage leaves to a paper towel lined plate. (Reserve 4-6 sage leaves for topping and add roughly crumble the rest.) Remove the butter from the heat* and transfer to the bowl of a large food processor, or the bowl of a stand mixer (with whisk attachment). Peel the sweet potatoes and transfer them to the bowl with the butter. Add in the nutmeg, crème fraiche, ½ teaspoon of salt and ¼ teaspoon pepper. Pulse or gently whip until incorporated. Add in the half-and-half, a heaping tablespoon at a time, and gently whip until combined. Stir in the crumbled sage, pancetta and garlic (reserve some for topping if desired). Taste and adjust for seasoning with salt and pepper, and consistency with more half-and-half. Transfer to a serving bowl and top with crumbled reserved crispy sage and pancetta. Enjoy! 1. The calls for 3 pounds of sweet potatoes, which is roughly 3 large sweet potatoes. But, the weight of 3 pounds is a rough approximation for the recipe! If you are a little light, or a little heavier on the potatoes, it is no big deal! 2. While the recipe does use pancetta, you can absolutely substitute plain bacon if you would like! Simple proceed with the recipe as instructed, replacing bacon for pancetta in the recipe. 3. While I do recommend crème fraiche in this recipe, you can use full fat sour cream if you can’t find crème fraiche or simply don’t like it. If making the substitution, please be aware that crème fraiche is thicker, richer and less tangy than sour cream. 4. The recipe calls for half-and-half, but if you like richer potatoes, you can absolutely use heavy cream. The amount of half-and-half (or heavy cream) you use in the recipe will depend on personal preference and the desired consistency of your potatoes. I used 2 ½ tablespoons in mine. 5. 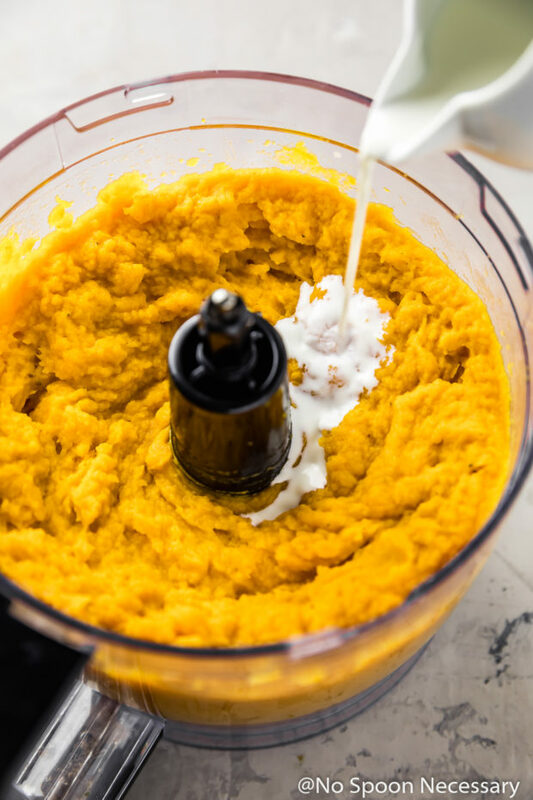 If you would like to drizzle the top of the whipped sweet potatoes with brown butter you can either reserve 2-3 tablespoons of the brown butter before adding it to the food processor, or you can simply make more brown butter. 6. The recipe serves 4-6, but can easily be doubled!! I remember these potatoes fondly Chey! That pancetta, brown butter, sage combo is amazing! And I’m always more into sweet potatoes this time of year! Delicious! Looks so creamy and rich tasting, might have to add this to the Thanksgiving menu! Now, THIS is my kind of Thanksgiving recipe. True confession time – I’m not a big fan of Thanksgiving dinner. BUT, I always looked forward to the sweet potatoes. 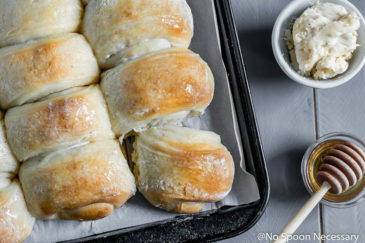 My family usually prepares SP with brown sugar and marshmallows but I’m loving the savory notes to this recipe! My kinda side dish!